There it is, the scrape of hard knee puck plastic against pavement – proof positive of the Ducati Monster 1100S’s prowess. At coffee shops the world over Monster owners will high-five over lattés celebrating what great riders they are, the truth is in the bike though. With a new chassis, revised air-cooled twin, and trick high-end suspension the 2009 Monster 1100S is a huge leap forwards in refinement from its precursors, making dragging a knee about as hard as sliding off a chair. 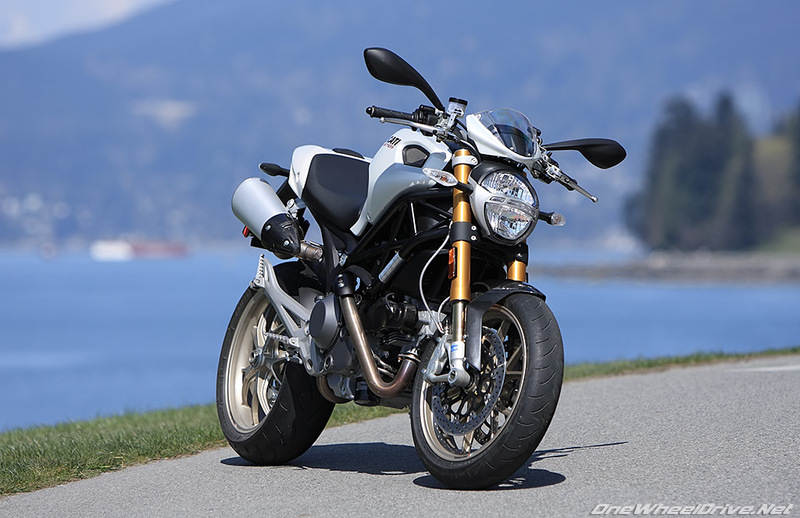 Glistening in a gorgeous pearl white paint job, there’s a strong family resemblance to the Monster 696, which revived the 15-year-old Monster franchise last year. The Monster 1100S shares much with its smaller sibling; a digital instrument panel, split (and replaceable) fuel tank covers, stout under-seat bugle exhausts and a trellis frame using the same diameter and thickness of tube as the 1098R. There are differences, the artistic single-sided swing-arm and whirling death petals of the 5-spoke alloy rims. Then there’s the heart and soul of the 1100, an air-cooled 90-degree twin looted from the Multistrada and Hypermotard 1100 and revised. The engine has undergone some choice refinements. The crankcases are vacuum die-cast, like the 848’s, losing 6.5lbs/2.9kg from the S2R’s. While Siemens fuel injection with 45mm throttle bodies replace Marelli units. Since each cylinder in the L-twin operates in a different environment, Ducati’s solved the compromise of a single fuel injection map by having one oxygen sensor per cylinder and a mapping for each too. The result of these ministrations? This revision of Ducati’s L-Twin should be deemed an Italian national treasure. The fuelling is crisp, glitch free, responsive and immediate and direct off the line. And while the 1100 puts out the same 95hp as the outgoing S2R, it reaches this figure at 7500RPM – 500RPM sooner. This is a Monster and that means a lineage of torque over moderate horsepower. The engine shoves out 79.5 ft-lbs at 6000, up 6.5 ft-lbs from the S2R, and rolling on the throttle exiting “photo shoot turn” in second gear leaves no question of the increase. For good measure I try it again in third and forth, mentally re-badging the 1100S the torque monster as it charges out of the corner, front tire skimming the asphalt with ease that makes in-line fours jealous. The brawny power starts from 3000RPM, tons of torque can be found before 6000RPM, and continues with effortless shove to the 8000-rpm “red light flashing” rev limiter end. At best a low and surprising barrier. Whenever it’s running the Monster poses a delightful mystery; who was bribed to get the 1100S through noise regulations? From at-idle growl to basso engine note, rich intake honk to burbling popping exhaust overrun, Ducati has achieved a decadent soundtrack. A set of Termignonis is no longer the first accessory a new Monster owner opts for. Which isn’t to say the 1100S is overly loud. The Monster cruises along in the smooth 4000-6000rpm range quiet and civil. With a slightly forward sporty lean, it’s fairly comfortable and more upright than previous Monsters thanks to tapered aluminum bars, which reach further back. Then the speeds climb, as they inevitably do. The small flyscreen is effective to 120kph, but here’s a neat trick – even at 170 windblast isn’t stripping you from the seat. Meanwhile the cat’s-eye mirrors, with a bit of angling, give good rearward view, letting you scan for signs of red and blue. For those long of leg the 1100’s seat is 10mm higher than the 696’s, but the 810mm seat height keeps the big Monster approachable. As does the dry weight, at 169 kg/373 lbs the 1100 is 8.6kg/19lbs lighter than the outgoing S2R. While our S tester sheds another kilogram graced as it is by aluminum front disc inner rotors, carbon fiber infill body panels, timing belt covers and front mudguard and golden Ohlins suspension. Up front the 1100S rides on beefy fully adjustable 43mm titanium nitride coated Ohlins forks, while a progressive Ohlins rear shock absorber with adjustable pre-load and return damping keeps things connected in the rear. Some dialing may be in order though, on rough roads the forks’ stock settings seem firm and a bit under-damped, leaving the front end skittering across the chop. Smooth roads are bliss as the Monster 1100S displays devil may care confidence through the twists. Where the narrow tire’d 696 scampers through the corners, the 1100S is fluid and planted, with the turn in being a hair slower. That’s in part down to the wider rubber, 120mm front and 180mm rear. The chassis and suspension convey a great sense of exactly what the sticky Bridgestone BT016 tires are up to – good because these neutral steering buns take their time warming up to road holding temperatures on cool days. 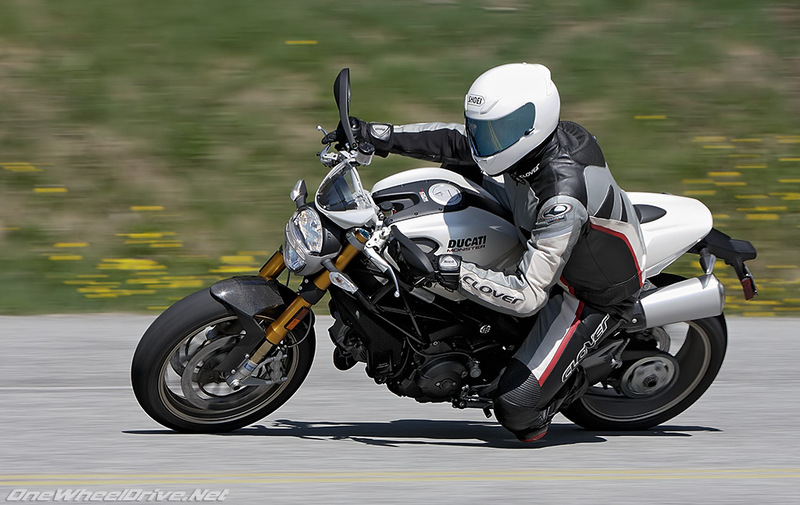 Shooting through twists though, the Monster 1100S is truly and fully in its element. I always felt the S4R was a flighty and leery quarter-horse ready to spook and the S2R was a bit tired from years of service, but the new Monster has a neutral feel requiring no additional input once set into the corner and are utterly, exquisitely predictable. Charge out of a tight turn in second gear, and into the sweepers with a suite of upshifts, and the transmission feels slightly stiffer than Japanese offerings. It’s affirmative though, with no false neutrals, missed shifts, or complaint on clutchless upshifts. For the Monster 1100 Ducati has returned to the traditional dry clutch, rather than 696’s the wet unit. The pull at the left lever is firm, but is lighter and less tiring than previous generations. Still you can’t entirely change the dry-clutch’s nature; the plates still rattle and a bit of grabbing and groaning occurs with high rev starts and long stints of though traffic crawls. Getting urban with the Monster, inevitably a rat through rush-hour offers a chance to test the Monster’s panic stop capabilities . Garnished with a radial-pump master cylinder and braided-steel lines the 1100S features more braking power than the 696. The pair of radial-mount 4-piston Brembo calipers squeezing the twin 320mm rotors up front are strong, but offer great road feel as Ducati has wisely toned things down from the 1098’s touchy land anchors. The other payoff as we sweep through a series of clover leafs, the 1100S happily continues turning with no tendency to stand up under trail braking. One problem though, under heavy braking the canted seat slides the rider’s groin into the tank. Offering men penance and contraception all in one. Other irritants are less traumatic. The digital display is compact but the thin numbers on the liquid-crystal speedo are hard to read at a glance. And while the understeat exhaust nicely warms your rump on cool days, but we predict a good self-lubricating sweat during hot summers. For that matter your passenger had best be wearing nomex leggings thanks to the exhaust placement. You’ll probably not hear their cursing over your own, having crushed your thumb between the tank and bar when executing a full lock turn. These are easy things to forgive. A few more scrapes of the puck through a favorite turn and we head back to the coffee shop for a latte and contemplation. 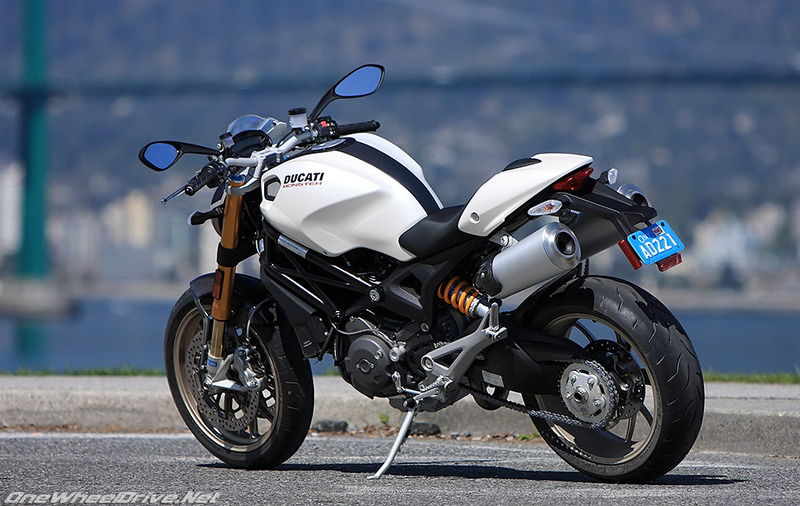 The new Ducati Monster 1100S has reached new levels of sophistication. After years with only a little nip and tuck, the Monster 1100S regains its holistic cool, charisma, balance, striking clean looks and something new – deep refinement.